Digital humanities have rich and largely unexplored potential for philological research in Classics. I hope that making my database of all the speeches presented in the Homeric epics available online will offer a specific example of how new technological tools can enable Classicists to develop innovative and fruitful approaches to the enduring questions that are central to our discipline. 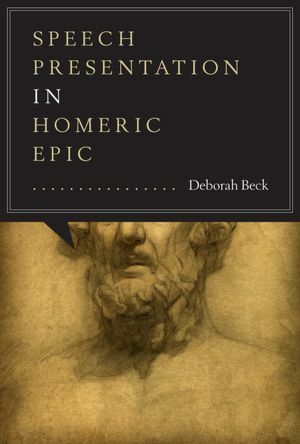 My book, Speech Presentation in Homeric Epic (University of Texas Press, 2012), explores how various ways of depicting speech shape the narratives in the Homeric poems; similarly, this database and the kinds of questions it allowed me to ask has shaped the scholarly narrative in my book. I hope that making it directly available to all will shape future scholarly inquiries, and that users of the database will tell me how they have used it and what kinds of questions it has helped them to explore. The origins of the database, as a personal research tool developed incrementally over a long period of time, led the design in somewhat different directions than it would have gone if broad user-friendliness had been a top priority from the beginning. I hope that this online database - unlike my personal FileMaker 9-generated version - is clear and straightforward to use, for which I owe warm thanks to the LAITS staff who prepared it for online use, especially Gavin Sellers and Lauren Moore. Moreover, some aspects of the data are formatted differently for the online interface than they were in my FileMaker version; this means that some searches that appear in my book cannot be exactly replicated with the online database. Some kinds of multi-field searches are not yet available at the time of release (July 2013), but we expect to make more kinds of functionality gradually available. If you have requests or suggestions about this, please email me at database@utlists.utexas.edu - we are eager to make the database as responsive as we can to users' needs. The database has been proofread to a high, but not a perfect, standard of accuracy. The user notes are intended to complement the section of the book's introduction that explains how the database was constructed (introduction available here). A series of screen shots under examples illustrate a few sample searches as a way of explaining how the online interface works, and what kinds of searches it is most suited to explore. "This book represents an original approach to Homeric speech, makes excellent new points ... and offers data no one has previously presented."